Reimbursement of State Playdown entry fee at cost. Reimbursement for out-of-town bonspiels or championships (excluding state playdowns), camps and training conferences will be $50 per event up to $250 annually. Reimbursements for out-of-town bonspiels or championships (excluding state play downs), camps and training conferences are $50 per event up to $150 annually. Beginners, intermediate and avid curlers in 6th to 12th grade can participate in the Monday After School Curling Program from 3:45 to 5:15. Open to boys and girls, Juniors will get instruction and competition suited to their level of play. For those with interest, we intend to host competitions against other out-of-town programs, and will make at least one trip to an out-of-town competition. The program begins the first Monday in December and runs every Monday at 3:45-5:15 pm through March 12, 2018. Register in person at the Bemidji Community Education office, or at www.bemidjicommunityed.com. Fee is $50. 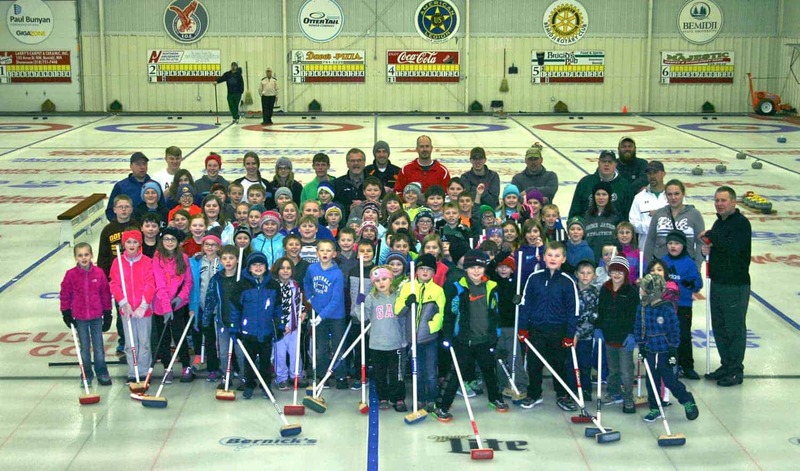 Boys and girls in grades 1-5 will start curling Sunday Nights at 5:30pm, starting the first Sunday in January. The program will run Sundays from 5:30 – 7:00 with open curling from 7:00 – 7:45, running 7 weeks around the club schedule. Registration is available in person at the Bemidji Community Education office, or at www.bemidjicommunityed.com. Fee is $55. 10. The Bemidji Junior Committee puts on the outdoor curling event at Winterfest on Lake Bemidji. Proceeds from this event go to support the Junior Curling Program. 9. Junior funds are used to purchase brooms and sliders for use by the Juniors and others during open bonspiels. We have also purchased curling shoes that are rented to the kids for $20.00/year. $50.00 reduction in league dues if they join the club. Payment in full of entry fee for State play downs. 7. They can participate in two Junior bonspiels here per year with a very low entry fee/team. 6. Travel is arranged as a very low cost to sponsored out of town bonspiels. 8 teams traveled to Fargo for a bonspiel there. 6 teams traveling to Brainerd this weekend. A trip to Chisholm is planned for later this year. Bemidji and Fargo have a standing junior club competition that now is in its 3rd year. Bemidji had 3 teams register for state play downs and two players in the high performance program. 5. A curler is considered a Junior until they reach 22 years of age. 4. The number of kids from the Bemidji junior programs that have been to the Olympic trials; won state, national and world championships would be too long to list. 3. Bemidji has had a representative in the Olympics most years since it was introduced, most started in the Junior program. 2014 – Jared Zezel, threw 2nd on the John Shuster team, Jared went to college at BSU and participated in our junior program. 1. You can stop at the club most Monday’s after school or Sunday evenings and see a future OLYMPIAN in training!